Our ears not only receive sounds but also play a role in maintaining the body balance. Damage to the ear can take place anywhere - outer ear, canal or inner ear - lead to hearing impairment. Sharp objects, injury, loud noise, etc. can cause temporary or permanent hearing loss. 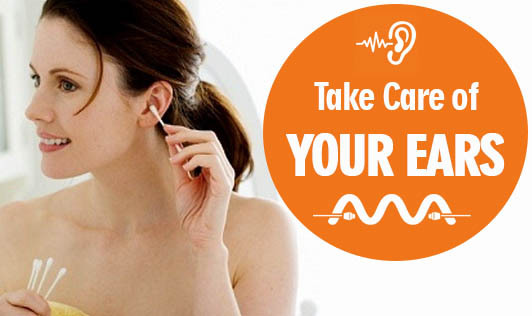 Do not rub your ear or ear canal vigorously. Let the ear wax come out of the ear on its own. Don't use cotton buds. Avoid clips, pencils, pins and pens to clean your ear. Nothing smaller than your elbow should enter your ear canal. Reduce noise pollution. Talk softly, don't honk on the roads, and avoid loud music. Avoid water in your ears. Ask your doctor's advice regarding warm oil treatment to clean your ear. If a foreign object enters your ear, meet a doctor. Don't attempt to remove it yourself. Do not neglect hearing problems or ear ache. The sooner you treat it, the better.